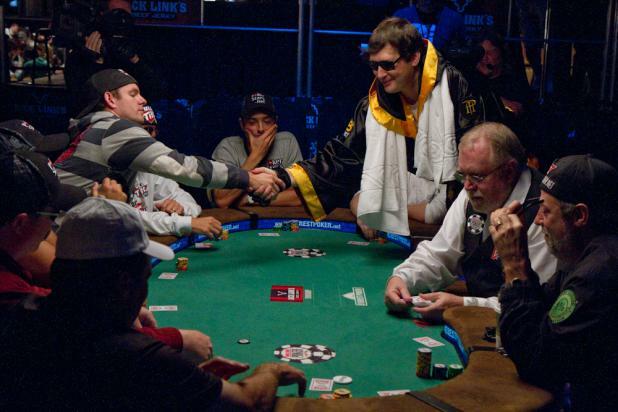 Phil Hellmuth walks around the table and shakes hands with all of the other players before sitting down to play his first hand. Doesn't Everyone Live Like This? Phil Hellmuth mugs for the ESPN cameras after receiving good-luck kisses on the cheek from the girls behind him. After Phil Hellmuth enters the Amazon Room and takes his seat at ESPN's secondary featured table, the two girls who escorted him give him a good luck kiss. Phil Hellmuth and his entourage walk toward the Amazon Room, slowed down a bit by the massive crowd of fans and photographers. The girls behind him are carrying large cutouts of bracelets over their heads to signify the record 11 WSOP bracelets that Hellmuth has won during his career. Mike Matusow (left) and Phil Hellmuth are friends, but that doesn't mean that Matusow will let this opportunity pass without pointing out the absurdity of the situation. 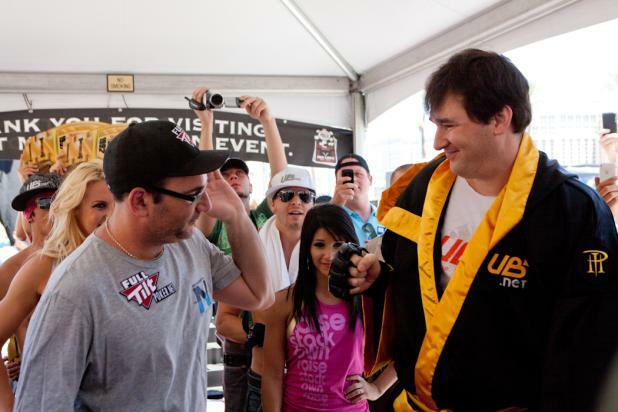 Matusow was near the front row of the stage show when Hellmuth was introduced, joking that he paid $40,000 for the privilege of seeing the spectacle before mocking the entire situation. Bruce Buffer, who announces the main events for the Ultimate Fighting Championship, introduces Phil Hellmuth to the crowd. 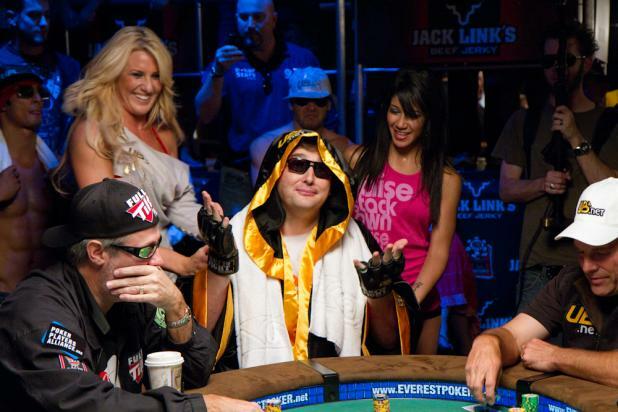 What started out as a simple tradition for Phil Hellmuth (showing up late to the WSOP Main Event) has escalated in the era of televised poker to become an over-the-top spectacle. Hellmuth's sponsors spends tens of thousands of dollars to make sure that -- love him or hate him -- all eyes are on Phil Hellmuth at the start of the biggest tournament of the year. A temporary stage was set up outside the Rio, and dancers warmed up the crowd before Hellmuth took the stage. Phil Hellmuth registered to play Day 1c of the WSOP Main Event, but an hour after play began, he still hadn't shown up. With a starting stack of 30,000 in chips and opening blinds of 50-100, the damage to his stack was barely noticeable. Erica Schoenberg finds herself sharing a table with poker legend Dan Harrington late on Day 1b of the WSOP Main Event. Schoenberg was a professional volleyball player and a professional blackjack player before turning her sights toward poker. 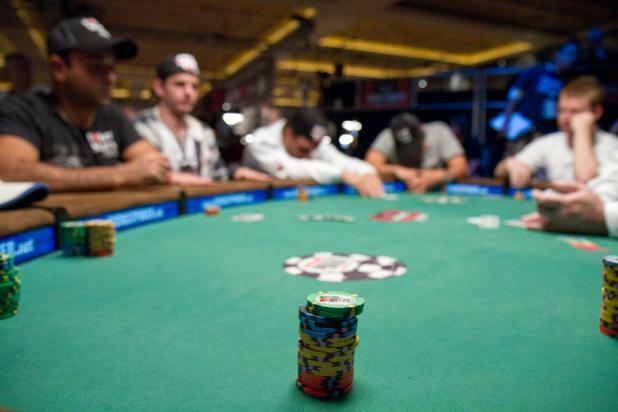 Harrington, wearing his favorite green Boston Red Sox cap in the foreground, is hoping to make another deep run in the WSOP Main Event -- he has reached the final two tables five different times since 1995. 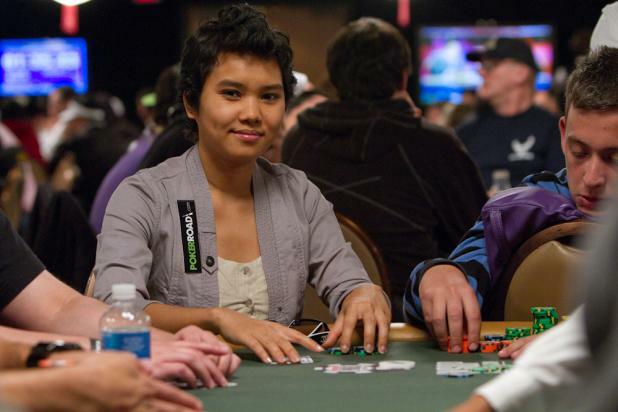 The month after last year's WSOP, professional poker player Thuy Doan was diagnosed with cancer. Doan lost her hair to chemotherapy treatments, and that's when something special happened -- 17 fellow poker players gathered together and shaved their heads in solidarity. The list of players who shaved off their hair for Thuy (pronounced "Twee") reads like an all-star tournament: Doyle Brunson, Phil Ivey, Barry Greenstein, Tom "Durrrr" Dwan, Bertrand "Elky" Grospellier, Eli Elezra, and Joe Sebok. As you can see in this photo from Day 1b of the WSOP Main Event, Doan's hair is growing back, and her spirits are high.